Ten community organisations in Peterborough have received almost £800,000 in funding from the National Lottery. The projects range from ice hockey for people with health problems to English classes for Nepalese children. The money is being distributed by the Big Lottery Fund (BLF), the largest funder of community activity in the UK. 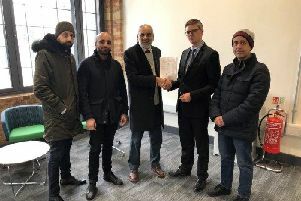 The biggest winner is the Peterborough Asylum & Refugee Community Association which has received more than £400,000 for its Peterborough Empowerment Activity Community Hub. The money will “provide support and services to improve the conditions and quality of life for those who are excluded, isolated, disadvantaged or discriminated against”. The Peterborough Plus VCSE Consortium Ltd has received £305,000 to support people experiencing poor mental or physical health, with activities including ice hockey, swimming and ballet. Leonie McCarthy, CEO at Peterborough Plus VCSE Consortium, said: “This is very welcome news and will make a real difference to people’s health across Peterborough.
. Peterborough Nepalese Society UK has received £9,000 to run a learning and activity programme every Saturday for Nepalese children, their parents and the community.
. Families First Peterborough CIC has received £9,300 to install new outdoor play equipment at its Charteris Playground.
. Peterborough Football and Sports Development Foundation has received £9,700 to hire a community development coordinator to help run new activities and improve how services are run.
. Access Community Radio has received £9,900 to create a community internet radio station run for and by people with impairments.
. Orton Park Cricket Club has received nearly £10,000 for a project to provide a place for people to socialise and for groups to utilise.
. FAYAL has received £10,000 to run support sessions for young people from African backgrounds struggling to gain employment.
. Sunflower Seed pre-school in Newborough has received £10,000 to help build new pre-school provision.